"This is a poster advertising German shoes. Lucian Bernhard (died 1972) devised the new style of poster in 1902. He displayed the product in splendid isolation, accompanied only by its name. Both elements were drawn directly on the stone (for lithographic printing) and printed in rich colours. 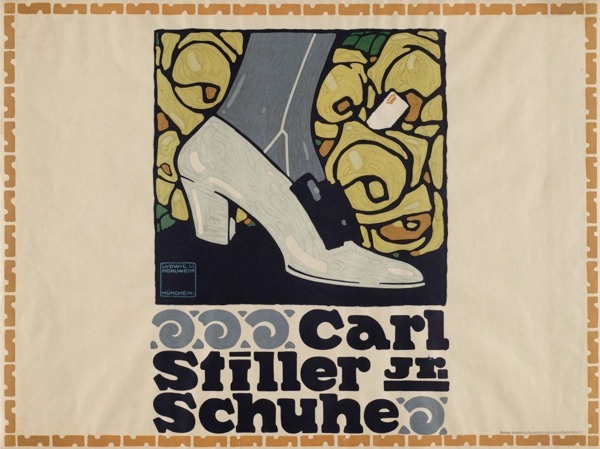 This sachplakat or new ‘object poster’ inspired many artists associated with Hollerbaum & Schmidt, the leading printers in Berlin, to follow his example." I must say, the project for the matches Priester - point of origin of the Sachplakat style - is dated 1903; anyway, as strange as it is, the Stiller ads are crucial to the history of language and visual communication. Before everybody, graphic designer Lucian Bernhard introduced the first commandment of visual advertising: etch in the customer's brain what you want to sell and what it is called. 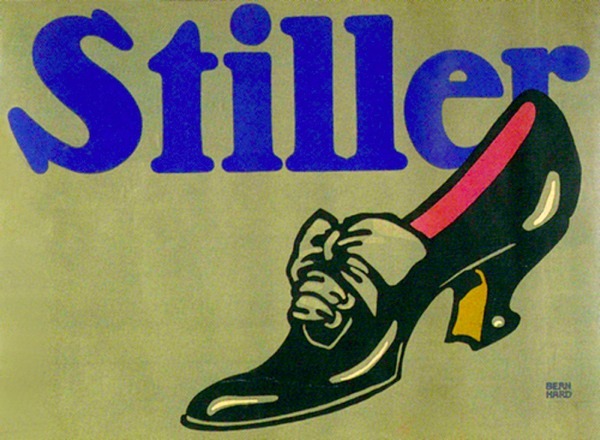 The second Stiller ad (below) was designed by Ludwig Hohlwein and it mirrors his friend/colleague (and rival) Bernhard because his client, Stiller Jr., was competing against his own father. So, that's how it all started: a pair of shoes and family bad blood. My appreciation of the past helped me do the illustration for "Whatever Happened to Father? ", a cover for the New York Times Magazine. Here my inspiration was the graphic genius Ludwig Hohlwein, the leading German poster artist of the 1930s, who was known for reducing an image to its essential elements.